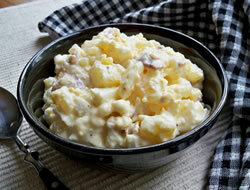 A traditional potato salad recipe that makes an excellent side dish. 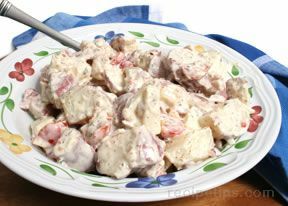 This potato salad is perfect to serve with any of your summer grilled burgers and steaks or any other meat and sandwiches throughout the year. Cook the eggs to a hard boil. Cool completely. Peel and boil potatoes; cool completely. 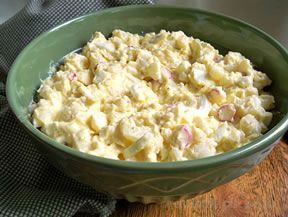 Slice the potatoes and put in a bowl large enough for mixing the potato salad. In a separate bowl, combine the salad dressing, mustard, sugar, onions, pepper, and salt together; stir to mix together thoroughly. Peel and cut eggs in half; remove the yolk and place in a bowl. 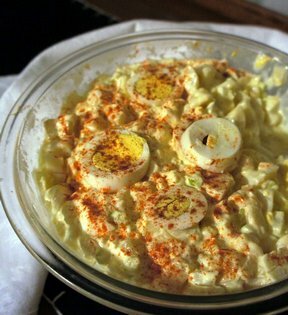 Slice egg whites and add them to the bowl containing the sliced potatoes. Mash egg yolks thoroughly and add them to the dressing mixture. Add the dressing and egg mixture to the potatoes and egg whites; stir and mix thoroughly. Stir in sliced radishes, if desired. Best to refrigerate the salad for several hours before serving. This recipe can be made one or two days ahead of when you need to serve it.